11:32 AM CT: John Rock is questioning Joe Mansky. Exhibit C209 is the current topic of discussion; the document is an email Mansky sent to Tony Trimble after they had concluded sorting the rejected absentee ballots. The purpose of the letter was to explicitly state that the addition of further ballots was not within Ramsey Counties jurisdiction pursuant to the MN SC ruling. Mansky also stated that there were other ballots in the wrongfully rejected universe and that he was not and still is not opposed to counting those. 11:35 AM CT: The topic shifted to the creation of duplication of ballots. Mr. Mansky discussed the scenario of ballot duplication of absentee ballots. He essentially regurgitated the same information, and process that Mr. Gelbmann witnessed yesterday. The federal ballot is authorized under federal law who are indefinitely living outside of the USA but are still eligible to vote for the federal offices. Pres, Senate and House. 11:39 AM CT: They established 8 recount teams and "two or three" election judges from St. Paul for each team. The judges counted the ballots that the recount teams had sorted into piles of 25; their was a separate pile for each candidate. 11:42 AM CT: The election officials were not aware of the machine determination during the recount. Duplicate ballots were produced in Ramsey County on election night. During the recount, the duplicate ballots were used when the situation presented itself. In past recounts, it was customary to count the duplicate ballots with the originals on hand for verification if the need arose. 11:45 AM CT: Mr. Mansky stated that it should be possible to discern any errors in the counting of duplicate ballots based upon the number of votes and the number of voters. A hypothetical situation was then presented to Mr. Mansky; in Mr. Rocks scenario the originals were to be counted. Mr. Mansky stated that duplicates would have been sorted out. Th e next scenario presented involved original ballots for which its corresponding duplicate could not be found, under the pretense that originals were to be counted. 11:49 AM CT: Mr. Mansky was then asked how an audit would be conducted to verify that double counting did not occur, pursuant to Rule 9 for the above scenario. Mr. Mansky stated that it would be possible to identify this occurrence based upon the number of recounted ballots and the number of total voters. 1:31 PM CT: Charlie Nauen represents 61 voters whose absentee ballots were rejected; this group was established by the Franken campaign. He also spoke to the issue requesting a summary judgment for these voters. 1:43 PM CT: Mr. Nauen just listed off a series of voters whose ballots were rejected, but whose votes should be counted. He then went on to say that Mr. Mansky stated that two ballots from Ramsey County belonging to the group of 61 petitioners should have had their votes included in the wrongfully rejected absentee ballot pile. 1:50 PM CT: A group of state workers are now addressing the three judge panel with respect to the petition above. Pat Diamond is now speaking; he is an attorney for Hennepin County. He is also appearing on behalf of Crow Wing County. He stated that 16 of the 61 ballots included in the petition are from Hennepin County, with one from Crow Wing. 1:56 PM CT: Mr. Langdon then took the floor; he stated that he believes that these 61 ballots should be counted. The Franken side did not offer a response. Mr. Nauen took the floor again and discussed some further issues associated with his constituents. 2:03 PM CT: Bruce D. Kennedy then took the floor; he is representing were voters whose absentee ballots were also not counted. He has no idea who these people voted for, he has not asked them and he will not ask them. 2:06 PM CT: Mr. Kennedy put forth the grounds under the intervention was presented to the court. Mr. Langdon took the floor and stated that he also believes that these seven ballots should be counted. He stated that their are other voters with similar claims that deserve to have their votes counted. 2:09 PM CT: Franken's lead attorney, Marc Elias, was then allowed to respond to Mr. Langdon and the intervention brought forth by Mr. Kennedy. This is not a question of whether these voters should be considered, the question is whether the intervention is the correct process; it would effectively created another participating party. Mr. Elias does not believe that all seven voters were included in the 1,354 originally identified wrongfully rejected absentee ballots. Each campaign will check their records to confirm this assertion. 2:14 PM CT: The court stated that they would release an order relating to the voter intervention, the court then recessed until Monday. 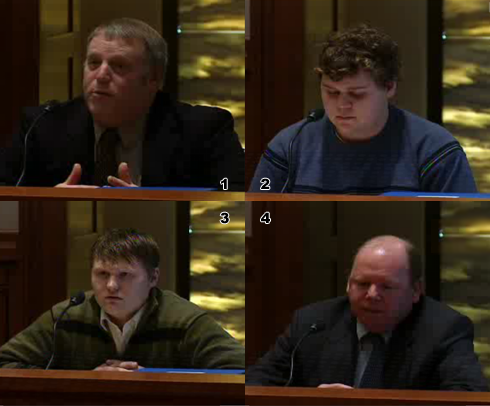 Summary [9:31 PM CT]: If you recall, yesterday concluded with Joe Mansky, Ramsey County Election Official, at the witness stand; the trial picked up right were it left off with Coleman attorney John Rock performing the questioning. They were on the topic of voter registration, specifically inactive voters. A vote becomes inactive if they do not vote for four years. Mr. Mansky stated that inactive voters can essentially "register on election day," and their vote will be counted. Joe Mansky then stated that an application for an absentee ballot could be hand written on a blank piece of paper; there is no specific document that must be filled out. You must fill out some sort of request before an absentee ballot can be mailed. Mr. Mansky then discussed and defined early voting in Minnesota; he stated that early voting was not specifically outlined within Minnesota law, but it did occur in the 2008 election. Mr. Mansky stated that their was a substantial increase in early voting when compared to previous elections. Mr. Mansky was then asked to establish the process a voter would have to undertake in order to vote absentee. He then continued by saying that the secrecy envelope is scanned and a link is provided within the registration database for use by election officials. Apparently their is a process, at least in Ramsey County, by which voters are allowed to vote in person up to five Fridays before election day. If an error is made, and the error is identified at least five days before the election another absentee ballot will be mailed to the voter whose ballot was rejected. This process varies on a county by county because not all counties have an absentee canvassing board. In some cases, an "agent" is used to allow ill or disabled voters the capability to vote. This option is available up until 3:00 PM on election day. Mr. Mansky stated that the vast majority of absentee ballots are received around 6:00 PM, but due to the large number of absentee ballots this year, the deadline was pushed back in some precincts. There are two type of absentee ballots; one version is for voters who are already registered, and the other classification includes ballots which must be accompanied by a valid registration form in order for the associated vote to count. "In Ramsey County they use a header card" to distinguish absentee ballots from regular ballots when the ballots are machine counted. If their is a registration outside of the secrecy envelope, election officials do not open the secrecy envelopes, "as a matter of practice." Voters whose ballots are identified as invalid within the aforementioned five day window are not notified of the error; they are not mailed another ballot. The voter is classified as having voted for the purposes of remaining an active voter within the registration database. Mr. Mansky then laid out the process by which absentee ballots are examined and eventually counted. Election officials do not actively search for a signature or other misplaced information on the absentee ballot; "if we don't have a clear indication that the person is registered to vote," the resources are not available in both time and man power to investigate each individual case. Mr. Rock then asked if a witness whose ballot was rejected yesterday should have been counted. Mr. Mansky was very clear that some ballots were rejected because adequate information was not available when the decision was made on election day. He stated that the witnesses vote would have been counted if the information that is currently available was available when the decision was made. Mr. Mansky stated that election officials try to err on the side of enfranchising voters. Mr. Mansky explicitly stated that mistakes are made when deciding to accept or reject absentee ballots. There was a little under 31,000 total absentee ballots in Ramsey County; the rejection rate was about 5%, which was slightly higher than in previous years. Mr. Mansky could not provide any factual reason for this increase but did express an opinion; he believed that the influx of new voters attributed to the increase in the rejection rate. Ramsey County sorts rejected absentee ballot by issue; this facilitated the creation of the infamous fifth pile. The wrongfully rejected absentee ballots which were counted on January 3rd are in the custody of the Secretary of States' office. Mr. Mansky stated that there is "a small group" of absentee ballots which remain rejected that qualify to be counted; he stated that there was a minimum of 62 that fit this description. Mr. Rock then moved to Exhibit C210; Mr. Mansky has previously viewed this document during his deposition. The document contains a selection of rejected absentee ballots and Ramsey County documentation. 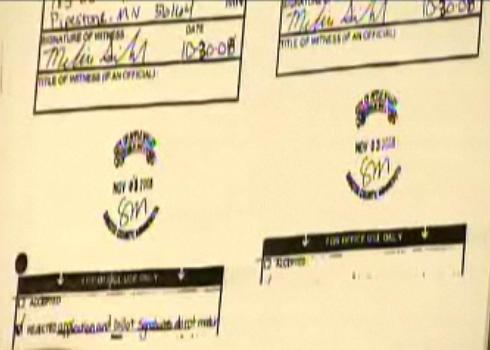 Mr. Mansky stated that a ballot from Roseville had an address sticker placed over the signature portion; this was an error by the election official, and as such Mr. Mansky believed that this vote should be counted. Mr. Rock moved forward with Exhibit C251, another return rejected absentee ballot with a missing signature. The address sticker was again placed over the signature portion, Mr. Mansky believed that this ballot should also be accepted. Mr. Mansky stated that he only needed to analyze the absentee ballot envelope to determine that the voter was not presented with proper instruction. Mr. Mansky asserted that Ramsey County officials try and give latitude to the voter when signatures are compared. Mr. Rock then presented yet another rejected absentee ballot in Exhibit C252; it was rejected because there was not signature no signature, but Mr. Mansky asserted that the proper signatures were present and the vote should be counted. Onto Exhibit C253, only this time there are three rejected absentee ballots and their associated registration and secrecy envelopes. They were all "apparently" rejected on a signature issue. Mr. Mansky stated with regard to the first ballot that the two signatures were somewhat different but they were not "dissimilar enough" to warrant rejection; Mr. Mansky likely would have accepted this ballot. On the second envelope, a middle initial was included in one signature but not the other; Mr. Mansky stated that he would "probably accept this" despite the inclusion of a middle initial. Mr. Mansky stated that the third ballot should also be accepted based upon another misplaced sticker from Roseville. Mr. Mansky then discussed some special circumstances where the voter themselves is not required to sign their own signature. In order for forgery to be permissible, it must have been indicated on the absentee ballot request form. In some cases, an 'X' can be used as a signature so long as the "same marks" are included on the application and the ballot envelope. Turning back to another Exhibit, C205; it contains another rejected absentee ballot due to mismatched signatures. Mr. Mansky stated that the signatures do not match and was therefore properly rejected. There was a note on the envelope stating that the signature was signed by somebody other than the voter; this complicated the manner, but they did not specify that another person would be signing the ballot when they applied for a ballot; had there been additional information about the voters physical condition the vote may have been allowed to count, but because this additional information was not available the vote was properly rejected. Mr. Mansky reaffirmed his previous assertion that it is not necessary for the signature to appear in the signature placeholder, but there is no guarantee that the election worker would have seen the signature elsewhere on the ballot. If they would have noticed a signature somewhere on the envelope, they were instructed to count the vote. Mr. Rock presented another Exhibit in the long line of rejected absentee ballots, C254. The election judge stated that the drivers license number was incorrect on the return envelope, but Mr. Mansky stated that this was not required by law. The ballot in question was for a non-registered voter; Mr. Mansky was then asked to refer to Exhibit C245, a list of the absentee ballots which were opened by the State Canvassing board on January 3rd, 2009. Mr. Rock then pointed out another ballot which was also incorrectly rejected due to the drivers license number, but was eventually counted. Mr. Rock referenced another absentee ballot which was rejected for a mismatched drivers license number. Mr. Rock then presented Exhibit C255 which contained three sets of absentee return envelopes and applications. Mr. Rock asked if he knew if any of the ballots listed within C255 contained a registration form within the secrecy envelope. He could tell based upon the format of the return envelope that the voters were deemed to have been registered by an election official receiving the absentee ballot request. Judge Marben then asked if there was a signature mismatch that was witnessed by an election official. Mr. Mansky stated that in that situation the election official would have known it was the same person who signed both signatures. In any particular situation, the election official would have been present and could have directly questioned the voter regarding the signatures. A fifteen minutes recess was ordered. The registration cards which are within the return envelopes are card stock so long as they are supplied by a Ramsey County election official. Another exhibit was introduced with three return envelopes and three application cards, C258. The first ballot was originally accepted and was "presumed" to have been counted. Turning back to Exhibit C245, the first ballot in C258 was not counted on election day, but was included in the 953 ballots which were classified as wrongfully rejected. The second ballot in C258 was marked as accepted, but it was not counted on election day, but was also included in the 953 ballot subset previously mentioned. The third and final ballot within C258 was marked as accepted and was also excluded from the election day count, but was eventually counted. The third ballot's return envelope was that of a non-registered voter, but was previously registered as noted on the envelope. Mr. Mansky stated that the noted would have caused the ballot to be treated as a registered voter's absentee ballot. Exhibit C259 was submitted with a single return envelope and a single registration form. Mr. Mansky was unsure as to whether the ballot was accepted or rejected; he stated that the ballot should have been accepted. Mr. Rock asked Mr. Mansky to find the ballot depicted within C258 in the list presented in C245. 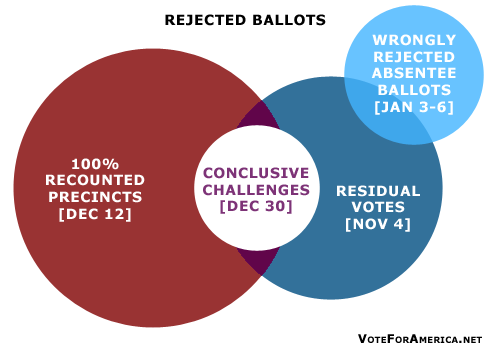 If a ballot is not marked as accepted or rejected, there is no clear protocol. Exhibit C260 was then presented with a single return envelope and the application form. The ballot was rejected with an unclear reason, but Mr. Mansky believed that the ballot should have been accepted. This ballot was also included in the 953 ballots that were counted on January 3rd. Mr. Mansky stated that the wrong absentee ballot is occasionally sent to a voter; in this situation a duplicate ballot is created and counted. The attention turned to Exhibit C261; this ballot had three return envelopes and three application forms. The first ballot was accepted, but was not counted until January 3rd; the ballot was originally rejected, and Mr. Mansky stated that the absentee ballot was not from the correct precinct. The election judges should have duplicated the ballot and counted it. The second ballot was rejected for the same reason as the first, and like the first, should have been counted. The second ballot was however not counted on election night or on January 3rd. Dating the signed envelope is not required for either the voter or the witness; a date mismatch is irrelevant. Mr. Mansky then defined the fifth pile which included ballots which should not have been rejected, but were; this fifth pile was partially counted on January 3rd. Election officials reviewed the polling roster for all rejected absentee ballots; they also looked at the reason for rejection. In most cases the inclusion of exclusion of a ballot could be determined from the face of the return envelope. Mr. Mansky stated that all possible permutations revolving decision that could made based soley upon the face of the return envelope were covered. At this point go read the log at the very top of the page starting at 11:32 and ending at 11:49 AM CT.
Mr. Rock established the information that would have to be acquired to determine the total number of voters and the total number of votes. Mr. Rock then presented a hypothetical situation to demonstrate the possibility of double counting; there were 110 votes and 100 voters. Based upon Mr. Rock's scenario, Mr. Mansky agreed that double counting was a possibility. Mr. Mansky suggested that abandoned duplicate ballots could have been identified based upon voting patterns and by their appearance. Mr. Rock concluded his questioning of Mr. Mansky; Mr. Hamilton stated that his cross examination would take "two to three" hours. Mr. Mansky was ordered to return on Monday as the court was going to devote its afternoon session to "several important motions." The three judge panel requested a meeting with the presiding attorneys in the conference to talk about future scheduling issues. The afternoon session began at around 1:30 PM CT and center around individual voters who were requesting to intervene into the election contest to ensure that their votes are counted. The afternoon session last about half an hour and is detailed above beginning at 1:31 and concluding at 2:09 PM CT. The election contest will resume on Monday at 9 AM CT. I plan on writing another article tomorrow providing a less detailed summary of this week's proceedings. In the meantime I would suggest reading my analysis of Norm Coleman's election contest and the subsequent data tables [PDF]. 4:24 PM CT: The Coleman campaign had called Joe Mansky, the Director of Election for Ramsey County, to the stand and some point during the day. John Rock, of the Coleman campaign, is currently questioning the witness. 4:28 PM CT: Joe Mansky just explained why some voter registrations are listed as November 5th. Any voter who filed a registration form within 20 days of the election is set aside and filled on the day after the election. The state suggests that such voters should register on election day when they vote in person. 4:30 PM CT: The court will recess until tomorrow, and the three judge panel would like to meet with the trial attorneys, from both sides, to discuss scheduling. Summary [9:26 PM CT]: The court rejoined this morning, but before anything actually happened, a private discussion (although still in courtroom) was conducted between the attorneys and the three judge panel on "two preliminary manners". The meeting lasted for about four minutes; I have no idea what was discussed. The attention then turned back to the witness Mr. Gelbmann , for the third consecutive day. Franken attorney Mr. Lillehaug captained the questioning by reviewing some testimony from yesterday regarding how the SOS and State Canvassing board were to count wrongfully rejected absentee ballots. Mr. Gelbmann then reaffirmed that state election auditors did receive training in all 87 counties, two days of training; the auditors then train election officials at each of Minnesota's "4128 polling places". Each election official receives two hours of training and the lead official receives either "three or five" hours of training; Mr. Gelbmann was uncertain. Mr. Gelbmann then talked about the inherent differences present at each training session across Minnesota. He referenced police training for identifying a drunk driver. The official training guide explicitly details the procedure for including, or excluding an absentee ballot. Mr. Gelbmann sated the we encourage our officials to "error on the side of allowing the vote;" he also stated that veteran election officials do a better job of identifying voters who may have a disability that impedes their handwriting ability. During the reexamination of rejected absentee ballots, the election officials were not supposed to rely upon the reason presented on the secrecy envelope; specifically if the reason was "not registered." If the reason was not registered, the local election officials were supposed to verify this conclusion. Mr. Gelbmann then verified that the local election officials had performed the due diligence required to include additional absentee ballots; he thought the process was "exceedingly thorough." There was a bit on confusion regarding a document which had been three hole punched through some of the text. Mr. Gelbmann explained that the SOS would have had to redraft and absentee ballot counting plan had the "relief" not been provided by the MN Supreme Court. Mr. Gelbmann established that the Coleman campaign agreed to "133" of the 1,346 wrongfully rejected absentee ballots proposed by the counties. At this point Mr. Lillehaug began introducing evidence and asking Mr. Gelbmann to identify the documents and provide some auxiliary information. The documents involved various different counties' procedures for handling absentee ballots that were requested for review; Mr. Gelbmann called the documents "email strings." They committed most of their time on this issue to Yellow Medicine County, which had "expressed concern" over the taxpayer expense associated with the request for review. They also focused on seven ballots in Itasca County. The presentation of "email strings" continued as the conversation shifted from county to county, vote by vote. Mr. Lillehaug was simply establishing that the evidence presented within the exhibits is infact accurate based upon Mr. Gelbmann's recollection and his position within the vote counting process. Mr. Gelbmann discussed the reason why each presented ballot was originally rejected and offered further procedural rules on a case by case basis. Mr. Gelbmann then read a quote referencing the Coleman campaigns request to include an additional 654 rejected absentee ballots based upon copies of "the envelopes furnished by the counties." Mr. Gelbmann then discussed the establishment and enforcement of the 10 AM deadline for the submission of rejected absentee ballots which were believed to be erroneously excluded from the count. He went on to say the the Coleman campaign did not meet this deadline with respect to the aforementioned 654 ballots. The 654 ballots were apparently presented at 3:08 PM, roughly 5 hours after the specified deadline on December 29th. Mr. Gelbmann reviewed "some" of the 654 ballots out of pure curiosity and was able to discern a pattern for their selection; unfortunately for Mr. Lillehaug, the Coleman campaign objected, and question remained unanswered. Mr. Lillehaug returned to the Franken side, and Coleman attorney Mr. Friedberg interjected an was granted the ability to question Mr. Gelbmann regarding the term "cherry picked." Mr. Friedberg established that Mr. Gelbmann worked for Sen. Mark Dayton (D) and was apprised of the internal happenings of political campaigns. Mr. Friedberg then tried to establish a definition of "cherry picked" based upon Mr. Gelbmann's testimony and passed work. His line of questioning was rejected by the judge and Mr. Lillehaug resumed the floor. Mr. Gelbmann was then asked to briefly describe the process of challenging ballots during the recount. The election official designated or "called" a ballot for a given candidate and then that decision became challengeable by two representatives from each participating party. Mr. Lillehaug then asked Mr. Gelbmann to read off the number of votes received by each candidate in the Minnesota State Canvassing Board's recount result; the vote total showed that Coleman recieved 1,212,206 votes an Franken received 1,212,431. Mr. Lillehaug then stated that he had no further question for Mr. Gelbmann; a fifteen minute recess was declared. After about 25 minutes the court resumed with Mr. Gelbmann still at the witness stand. I believe Mr. Friedberg took over questioning for the Coleman side. Mr. Friedberg first established through questioning that there was not yet a winner; the process was currently within the election contest phase, as specified by Minnesota law. They the discussed election official training; apparently the SOS office produces a training video but Mr. Gelbmann unsure if that was legally allowed to count for the two hours of required training. The discussion then turned to voter turnout; Mr. Gelbmann stated there were approximately twice as many absentee ballots during the 2008 election when compared to 2006 elections. Mr. Friedberg is attempting to illustrate that the election officials were not properly trained to handle the increase in absentee voting. Mr. Gelbmann stated that the election auditors, the professionals above election officials, were required to attend "breakout" sessions; one of the "breakout" sessions was two hours long and covered the issue of absentee ballots. Mr. Gelbmann recalled a noticeable increase in the number of absentee ballots cast in Hennepin and "to a lesser extent" Ramsey County over last election; he could not recall this phenomenon happening in other counties because he was not as involved in other counties. The discussion then moved to Rule 9; the conclusion by the State Canvassing Board to use the original ballots to determine the intent of the voter. Mr. Gelbmann was eventually asked to open the state issued election official training guide; he was asked to turn to § 14.2 which covers ballot duplication for the purpose of feeding a damaged ballot through the optical scanner. Mr. Friedberg referenced nine directions within the manual; his main point was that at least two separate judges with separate party affiliations must be present at the time of duplication; party status is dependent upon receiving at least 5% of the vote in the previous election. The election judges are supposed to mark the duplicate with the reason for duplication. The ballots are not mechanically duplicated; one election official dictates who the given voter voted for and the other election official fills in the votes on another, blank ballot. They then verify that the duplicate conveys the voter's intent, as depicted on the original according to Minnesota law. Mr. Gelbmann stated that "95% of ballots were duplicated after the polls closed." Mr. Gelbmann was then asked to address the discrepancy the number of original ballots and duplicates during the recount. He could not specify the exact county, but he stated that the first incident occurred on November 19th, the first day of the recount. Gary Poser was contacted about the issue. Mr. Gelbmann stated that if the duplicates were not marked, it would have been impossible to distinguish them from an original ballot. Mr. Friedberg then tried to establish a probable scenario in which the process of duplication and the ensuring counting mechanism may have created errors. Mr. Gelbmann presented the possibility of a voter not signing in on election day as another explanation to explain a discrepancy between the number of voters and the number of votes. A brief, private meeting (still within the courtroom) was held between the attorneys and the judges as a result of a questioned posed by Mr. Friedberg regarding his double counting scenario. The question was eventually withdrawn. The SOS presented a process that was approved by both the Coleman campaign and the Franken campaign that was designed to handle the issue of Mr. Friedberg's double counting scenario. The topic then moved to the chain of custody associated with each ballot. Mr. Gelbmann stated that any concern regarding the chain of custody could ultimately be heard in an election contest if the precinct or county or Minnesota State Canvassing Board did not satisfactorily resolve the issue. Mr. Friedberg then transitioned away from the double counting issue to the 171 ballots that were left in an optical scanner in Maplewood P6. Mr. Gelbmann stated that the chain of custody regarding these ballots was upheld, Mr. Mansky of Ramsey County agreed. Mr. Friedberg: If it pleases the court, we have had a challenge to those 171 votes; we are convinced that the integrity of the chain of custody has been protected and we withdraw our challenge to those Maplewood votes. The Coleman campaign just conceded a 37 vote Franken gain amongst these 171 ballots from Maplewood P6; based upon our previous work Coleman must now overcome a best case scenario deficit of 106 votes. The Franken campaign did not object. The Coleman campaign is not however conceding the issue that have arisen from Minneapolis Ward 3 Precinct 1. Mr. Gelbmann discussed a plastic bag that was found in the precinct that contained ten to twelve absentee ballots; he was not sure whether these ballots were eventually counted, but he believed they were. A note was attached to this bag stating that the particular election judge did not know what to do with these ballots. Mr. Gelbmann was not specifically involved in the search for the 133 missing ballots, he only had a passive involvement and would have to base any answer on "here say". The voter intent of these 133 ballots cannot be determined, other than the election night result, because the ballots are currently lost. Mr. Friedberg then questioned on the grounds of the chain of custody of these lost ballots, stating that "this is the ultimate chain of custody problem isn't it?" Mr. Gelbmann responded by saying that "[he] was not legally qualified to answer this question," and would like legal council if the current line of questioning is to continue. When the SOS was in need of legal advice, they asked the Minnesota Attorney General for guidance. Mr. Friedberg then switched gears and asked if the three judge panel would like to recess before a "different area" is covered. He began by recalling an exhibit presented by Franken before settling on Coleman-265. This exhibit was an email sent by Mr. Lillehaug to the Secretary of State's office entitled "Cover Letter, Memorandum and Declarations" and was received on November 17th by Mr. Gelbmann office. One of the attachments contains a memorandum from the Al Franken for Senate campaign regarding rejected absentee ballots. Mr. Friedberg then read a series of passages from the memorandum and then asked Mr. Gelbmann if he read correctly. The quoted passages focused on the issue of equal protection in regard to absentee ballots and those which were wrongfully rejected. Mr. Gelbmann was then asked about the documentation associated with the 401 wrongfully rejected absentee ballots which were identified by the local officials but were not agreed to by both campaigns, these votes were not counted. There is no information regarding which campaign rejected which ballots. At this point only the Coleman and Franken campaigns were involved; it was then learned that Independence Party candidate Dean Barkley was initially invited to recount proceedings, but declined to participate. Mr. Friedberg: Going down a little bit further in Mr. Franken's position, back then, post election statutory provisions that address such issues as the timing of election official's actions are generally directory and not mandatory. Procedural rules cannot override the principle that all validly cast ballots must be counted to reveal the electorate's true vote and the expression of its will. Skipping the citation. Quote, to rule otherwise, the court has recognized, would require the loser to become the winner in spite of the vote of the people. Did I read that accurately? Mr. Gelbmann: You read it accurately. Mr. Friedberg then continued to read through the exhibit and the contained text pertaining to absentee ballot inclusion after previous rejection. Mr. Friedberg then got "tired" and asked Mr. Gelbmann to read the next passage on equal protection as it pertains to absentee ballots. Mr. Gelbmann state that it "was not the role the State Canvassing Board to count these absentee ballots;" he stated that an election contest would be the appropriate medium for counting absentee ballots. Mr. Friedberg exhausted his questions relating to the current exhibit and the court recessed for lunch. When the trial resumed, Mr. Gelbmann was still on the stand, but the panel allowed Mr. Langdon (Coleman) to field another witness. Peter Robert DeMuth  was called to the stand. He lives in Fargo as a student; his permanent address in in Plymouth, Minnesota. Mr. Friedberg handled the questioning. Much like the previous civilian witness he was presented with his absentee ballot and his registration form. He received a phone call from the Republican Partynotifying him that his vote was not counted. He stated that he voted absentee because he could did not want to travel to vote on election day. He drover from Fargo this morning to appear in court today. He filled out his registration form on a computer and emailed it to the election office; he initialed on the signature line using a mouse instead of physically signing the document. Mr. Hamilton to cross examine the witness; he began by establishing the conversation when the Republican Party called. The Republican party asked him he supported Norm Coleman, and Mr. DeMuth responded "yes." The Coleman campaign also wrote the affidavit which Mr. DeMuth signed. Mr. DeMuth used a mouse to initial his name on the registration form because he did not have a printer and it cost money to print and scan at his College. Mr. Hamilton ended his questioning. Mr. Langdon again questioned the witness. He established that emailing the registration was a valid option presented by election officials and that as far as Mr. DeMuth knew, his parents were not contacted regarding his absentee ballots submission. Mr. Langdon stepped down and the floor went back to Mr. Hamilton. Mr. Hamilton establish that the witness was physically able to sign his name, he simple choose to do it on a computer. The witness was then dismissed. Mr. Langdon then called another witness; James D. Wadzinski . He lives in Hastings, Minnesota and verified his address as listed on his voter registration. He went to Hastings City Hall and cast an absentee ballot in front of an election official. Mr. Langdon basically established that Mr. Wadzinski wants his vote counted and does not know why it was not counted. Mr. Hamilton on the cross examination; Mr. Wadzinski was not absent from the precinct on election day and he had no personal knowledge as to whether his vote was counted or not. The witness was excused. Mr. Gelbmann went back to the stand and the questioning continued from Mr. Friedberg. They discussed the testimony of Mr. DeMuth with respect the computer generated signature. Mr. Friedberg established that the first signature presented by any individual should be assumed to be valid; the first signature is used for comparison of subsequent signatures. Mr. Friedberg then resumed the practice of allowing the witness to read a document and then subsequently provide additional information relative to their experience. The next line of questioning focused on placing absentee ballots into two piles based upon the "face of the lists," either erroneously rejected, or not. When using the "face of the envelope, the previous task was not possible. Mr. Friedberg then questioned Mr. Gelbmann regarding the possibility having accepted absentee ballots rejected. There is a statute within Minnesota law that allows a voter to vote in person even though they have completed an absentee ballot; the absentee ballot will be discarded. Mr. Friedberg then discussed the counting of deceased voters; Mr. Gelbmann stated that dead people's votes are not counted, but they do not check the obituaries. If a ballot is present, the election official assumes the voter is alive, unless they know otherwise. Mr. Friedberg then read a passage written by the Coleman campaign suggesting that rejected absentee ballots should be litigated during an election contest. Mr. Lillehaug began the cross examination. Mr. Lillehaug established the number of votes cast and the number of challenges; there were 6,500 initial challenges and about 1,000 ballots were actually examined by the Minnesota State Canvassing board. The MN Attorney General was consulted with regard to Minneapolis Ward 3 Precinct 1. The December 12th State Canvassing board meeting was then discussed; Mr. Gelbmann provided testimony on this day regarding the potential for erroneously rejected absentee ballots. The Minnesota Attorney General then used this information to make a legal decision. Not a single erroneously rejected absentee ballot was counted by a county canvassing board was because the "Coleman campaign went to the Minnesota Supreme court to shut it down;" Mr. Gelbmann agreed. Joe Mansky, the Ramsey County Election Director was then called to the stand by the Coleman campaign. He was on the witness stand for the remainder of today's session. John Rock, a previously unheard of Coleman lawyer, essentially sought to establish Mr. Mansky's position as an election expert with years of experience. He spoke about election day registration and the incidents that are subsequently filed by some precincts. He also discussed the various mechanisms by which these errors were reported. Mr. Rock then established the procedure by which the total number of ballots cast is calculated. Mr. Mansky defined over, undervotes and the Statewide Voter Registration System (SVRS). This list contains a lot of data that is used by each of Minnesota's 87 counties; this is where the counties can figure out if a voter is registered, and if they are their information can be update. The SVRS is used to mail registration notification post cards. Mr. Mansky then provided some details regarding voter who were registered on November 5th. Any voter who filed a registration form within 20 days of the election is set aside and filled on the day after the election. The state suggests that such voters should register on election day when they vote in person, but most do not. It is interesting that Mr. Mansky was called to the stand after the Coleman campaign conceded the 171 votes in Maplewood P6. Relatively little happened regarding Mr. Mansky's testimony; we will likely seem much more from Mr. Mansky tomorrow. I'll publish sporadic updates throughout the day, and I'll finish it up by doing a thorough summary at the end of the day; just like I did yesterday. 9:18 AM CT: Mr. Gelbmann is still on the stand and is speaking to the issue of absentee voting registration; Mr. Friedberg is doing the questioning. During the sorting of wrongfully rejected absentee ballots, election officials created a category called 3a in which they examined the secrecy envelope to determine if there was a registration card within the absentee ballot envelope. If there was a registration within the envelope, that vote may have been validly cast, despite the lack of prior registration. 9:43 AM CT: Mr. Gelbmann is now talking about a specific absentee ballot that was rejected; the ballot was cast in Hubbard County. The ballot was apparently rejected because the voter used a hyphenated last name that was not on the voter roles. Upon closer inspection, election officials determined that the voter was registered and that their ballot was wrongfully rejected. 11:31 AM CT: Mr. Lillehaug, Franken's attorney, is cross examining Mr. Gelbmann, who is still on the stand. I believe he is discussing the issue of potentially double counted ballots. Mr. Lillehaug is essentially trying to establish that election officials did not intentionally double count ballots and that the MN Canvassing Board passed the issue to this Election Contest. 11:45 AM CT: Mr. Gelbmann was asked to identify a document sent by Coleman attorney Fritz Knaak to the Secretary of State's office. The document highlighted a disagreement between the campaigns regarding their position on whether wrongfully rejected absentee ballot envelopes are/were private or public data. 11:49 AM CT: Mr. Lillehaug probed further by asking whether the Secretary of State's office ever definitively took a stand on the public or private issue. Mr. Gelbmann stated that the SOS had expressed the opinion that the envelopes should be public data. 11:49 AM CT: There was another document presented to the Minnesota State Canvassing Board on November 18th which was supposed to clarify each campaign's position on the absentee ballot custody issue highlighted previously. Mr. Lillehaug asked if this was a big deal at the time and the witness responded, "yes." Mr. Gelbmann then went on to say that "the decision of the local election officials should be assumed to be correct." 1:20 PM CT: The court is in recess until 1:30 PM CT.
1:34 PM CT: The court has resumed. Mr. Gelbmann and Mr. Lillehaug are still discussing the email correspondence between the Coleman campaign and the Secretary of State's office. The current document in question was emailed by an associated of Tony Trimble to the SOS office on November 19th. 1:50 PM CT: The Fox affiliate in the Twin Cities area has reported that the ColemanForSenate website was down after an influx of "tens of thousands of page views" after a searchable database of "disenfranchised" voters was made available. As a comparison, this site received around a million page views during the week of November 4th. I'd be willing to bet that the math associated with our election projections caused a far higher amount of server load than searching a database. This is yet another example of the Coleman campaign's technological ineptitude. 1:55 PM CT: Mr. Gelbmann is still on the stand, and is taling questions regarding the process required to duplicate a ballot. One of the judges just asked how many ballots were duplicated in total; Mr. Gelbmann said he had no idea. 2:00 PM CT: This will apparently be the last question related to duplicate ballots. Mr. Lillehaug presented a document sent by Mr. Gelbmann to Mr. Poser relating to a Brooklyn Park precinct. The Brooklyn Park election officials found duplicate ballots marked in "eleven precincts," of which there was no corresponding original. They apparently found envelopes containing these original ballots during the recount. Brooklyn Park asked the SOS office for guidance. The Exhibit stated that the SOS office instructed Brooklyn Park to re-review ballots in these eleven precincts. 2:05 PM CT: In the case of any discrepancy, the procedure is to count the originals. At the time, the Coleman campaign did not object to these proceedings. The talks moved forward to the events of the November 26th Minnesota State Canvassing Board meeting. At the meeting they discussed the possibility of wrongfully rejected absentee ballots. 2:11 PM CT: The next document presented was written by Tony Trimble and addressed to Mr. Gelbmann on December 12th. 2:17 PM CT: Moving on, the next document is also from Tony Trimble and covers rejected absentee ballot sorting. Within the document, Mr. Trimble expressed concern that the SOS had suggested "non-partisan" workers instead of election officials who had received proper training. Mr. Gelbmann stated that "the justification of an election judge is within the precinct that they are assigned to." Mr. Lillehaug then asked if Tony Trimble's intention was to have the absentee ballot review take place on the precinct level. Mr. Gelbmann responded by saying that Mr. Trimble just wanted election judges to preside over the proceedings. 2:23 PM CT: Moving on to the next Exhibit; Exhibit F79. A letter from Fritz Knaak dated December 29th to county election officials regarding the opening of rejected absentee ballots. Mr. Gelbmann was not a direct recipient, but had knowledge of the document's existence. Exhibit F88 is next. 2:28 PM CT: This document relates to Minneapolis Ward 3 Precinct 1; the precinct where an envelope was missing and not found during the recount. The letter is dated December 11th 2008. There had been considerable sorting by the counties as of this letter's writing. Mr. Gelbmann had concluded on or before this day that ballots had been wrongfully rejected. 2:31 PM CT: Mr. Gelbmann then read the following quote from the exhibit; "Every ballot in the 5th pile was originally rejected, by county election officials or an absentee ballot board or 2 election judges and that these ballots should be deemed improperly rejected, after an ad-hoc statutory counting process that is not clear or undisputed." 2:37 PM CT: Mr. Gelbmann was "convinced" that he saw wrongfully rejected absentee ballots; he saw evidence of this fact. 2:41 PM CT: The court will eventually recess at a convenient point around 3 PM CT.
2:42 PM CT: Brooklyn Park was not the only jurisdiction with duplicity errors; Maplewood Precinct 6 was brought into the fray. Mr. Gelbmann first heard of the situation in Maplewood Precinct 6 through Minnesota Public Radio. Mr. Gelbmann then contacted a Ramsey County election official. He learned that a voting machine broke down on election night, and the resulting ballots were not counted until the recount. He stated that neither campaign raised any objection to these proceedings initially. 2:49 PM CT: Mr. Gelbmann then discussed his conversation with the Ramsey County election official, Joe Mansky. The ballots which were not counted on election night due to machine error were found in an auxiliary box within the ballot scanner during the recount. Mr. Mansky stated that they were not counted on election night. 2:51 PM CT: Mr. Gelbmann stated that the Coleman campaign did take issue with the inclusion of these 171 ballots in the final recount numbers. Mr. Gelbmann personally believed that "it was appropriate to include [the 171 ballots found in the auxiliary ballots] in the final recount numbers." When asked if he believed these balots to have previously been counted, Mr. Gelbmann reponded with "no;" he was then asked if fraud was involved, "absolutely not." There were ballots found in Becker County and they were counted. There were no complaints filled by the Coleman campaign regarding Becker County. Mr. Lillehaug then brought forth another, similar case in Scott County. Mr. Gelbmann stated that these ballots, in Scott counted were counted and that based upon his work in Mark Dayton's (D) campaign, Scott County typically voted Republican. 2:56 PM CT: Afternoon recess. The court will resume in fifteen minutes, but I will not. I'll provided a detailed summary of today's events later tonight in this article. Summary [1:37 AM CT]: The day three proceedings actually started on time today, but before Mr. Gelbmann re-took the stand, the panel ruled on a motion put forth by the contestant Norm Coleman. Justice Kurt Marben stated that "it was a motion in limine to exclude evidence of each campaign's prior position regarding when and how absentee ballots should be reviewed. The panel has read the memorandum that has been received and are prepared to rule without further arguement." The motion was denied. Onto Mr. Gelbmann, again. Before I move further ahead I want to point out two documents which have been posted on the election contest judicial page that may be of interest. The first document is a listing of exhibits provided by the Franken campaign and the second document details Coleman's exhibits. The three judge panel is illustrated on the left side of the image below and a scene from the courtroom is depicted on the right. Mr. Friedberg, an attorney representing Coleman, is questioning Mr. Gelbmann, the Minnesota Deputy Secretary of State as Norm Coleman watches from the side. Mr. Friedberg resumed his questioning of Mr. Gelbmann after adjourning yesterday evening. Mr. Gelbmann voted for Dean Barkley. The first phase of questions concerned the creation of a 3a pile during the sorting of wrongfully rejected absentee ballots. Mr. Gelbmann discussed the standing order to include any vote, rather than exclude, if a questionable problem had occurred. This related to the 3a pile because election officials were asked to bend and fold and analyze the absentee ballot secrecy envelopes to determine if a registration card may be enclosed. Mr. Gelbmann stated that it could have been very obvious based upon the style of paper used for the registration form. He said that some registration forms were printed on card stock and were easily identifiable from the outside of the envelope. He stated that envelopes which the election judge believed to contain a completed registration form was placed in pile 3a where they remain. Pile 3a was not included in the recount. Mr. Friedberg then began to question Mr. Gelbmann on specific ballots which were rejected. He discussed the scenario by which originally rejected absentee ballots were reclaimed as valid votes. During the recount election officials were able to check a more comprehensive list of voter registration tables; for example, if a voter used a hyphenated name when they signed their ballot but they were registered using a non-hyphenated name their vote was likely rejected by the original election official. During the resorting, these errors were corrected. Mr. Friedberg posed several questions regarding specific absentee ballots that followed this pattern. Mr. Friedberg was trying to show that some ballots were tried differently than others, and thus their handling would violate the equal protection clause within the constitution. Mr. Friedberg finished with Mr. Gelbmann and the cross examination began, as lead by Mr. Lillehaug. Mr. Lillehaug got Mr. Gelbmann to say that ballots were not intentionally counted twice; which is not a revelation. The conversation then shifted to the issue of ballot ownership. Mr. Lillehaug referenced several documents which facilitated further discussion on the topic. Mr. Gelbmann established that there was a disagreement between the campaigns on the subject of ballot ownership; the Coleman campaign believed that the secrecy envelopes were private data, while the Franken campaign believed they should be made public. Mr. Gelbmann went on to say that the Secretary of State's office eventually sided with the Franken position. The topic then switched back to the issue of equal protection, Mr. Gelbmann stated in response to a question regarding the possibility of duplicate counting that "the decision of the local election officials should be assumed to be correct." The lunch recess then took place until 1:30 PM CT.
Mr. Lillehaug resumed the tedious process of reviewing email correspondence between the various parties involved in the recount. Mr. Gelbmann discussed the circumstances required for a ballot to be duplicated. One of the judges then asked him how many total ballots were duplicated, Mr. Gelbmann stated that he had absolutely no idea. At this point you should go read the timestamps above beginning with 2:00 and concluding at 2:56 PM CT. When the court resumed Mr. Gelbmann spoke about the issue of ballot security. If ballots are left unattended in an improper place and are found with broken seals, those ballot must be invalidated. This issue was raised because of the 32 ballots that were not counted on election day in Hennepin County, but were properly transported to the Minneapolis City Hall and counted later. They next discussed the missing ballots from Minneapolis Ward 3 Precinct 1; I believe the Franken campaign is waiting for another witness before they dig into this issue. Mr. Gelbmann was not deeply involved in the situation around this Minneapolis precinct; I think Cindy Reichert, the Hennepin County Election Director, is the only person who can provide testimony, with enough weight to settle this issue, in one direction or another. The trial will resume tomorrow at 9:00 AM CT.
9:12 AM CT: Nothing has happened yet, but I did snag a picture of the binder containing Exhibits C1 and C2. I don't know If all twelve binders make up the Exhibits, or if the binders are just stockpiled for later distribution. There was also a box that appeared to contain ballots, its impossible to know at this point, but it did resemble previous boxes used for storing ballots. 9:23 AM CT: Nothing has happened yet, I don't know if there is a delay or if the court simply wasn't scheduled to begin yet. Apparently the start of proceedings is delayed, possibly until 10:00 AM CT.
10:17 AM CT: The proceedings have been delayed; the judges are in a private meeting. A time for resumption has not been specified. Gary Poser, the Deputy Secretary of State, was just spotted in the Judicial Center. 12:37 AM CT: The trial will apparently resume at 1:00 PM CT; which just so happens to be the exact same time as when I need to leave. 2:35 PM CT: The Coleman campaign is calling a series of witness whose absentee ballots were rejected. Douglas Thompson took the stand at this time. "Is this your signature on the absentee ballot envelope" Yes. Is this your signature on the absentee ballot application. No. It appears as though the Franken attorney established probable cause for rejection of Douglas ' absentee ballot envelope. 2:38 PM CT: Jim Gelbmann, Dep. Sec. of State. will now take the stand. He worked for Sen. Mark Dayton (D). 2:41 PM CT: I don't know where they are going with this witness, and I don't have time to find out; more later. 7:41 PM CT: I'll have a more thorough update later tonight, or tomorrow morning. [The] Secretary of State's Office, the AGs, the attorney for the petitioner, as well as the three of us and our law clerks meet for almost all morning trying to work out the logistics of how to get the best evidence to this courtroom so that we can make the findings of fact that we need to make. We also understand that the municipalities and the 87 counties that are holding these original documents are under stress and strain for budgetary reasons and that's why we want to see if there is someway for us to streamline the process. Having said that, Mr. Friedberg [Coleman Attorney] had Ms. Sonnen on the stand yesterday when we ended. Mr. Friedberg stared by asking that Ms. Sonnen's testimony (from yesterday) be stricken from the record and the court moved forward with a slight objection from Marc Elias; I believe Elias wanted to question Ms. Sonnen, but she was not present. Coleman Attorney, Mr. Langdon, then proceeded by calling a new witness; Gerald Walter Anderson  a voter whose absentee ballot was not counted. Gerald Anderson first voted in "1952 for Eisenhower;" he is blind and is 75 years of age. Mr. Anderson mentioned repeated a similar refrain through his testimony; "my vote was not counted in America." The Coleman campaign seemed to be appealing for empathy, but they make an interesting case. They appear to be arguing that his vote should count because he says he signed his absentee ballot properly. Upon cross examination Mr. Anderson failed to recall when he signed his affidavit, he stated "Friday," but the affidavit was dated January 20th. Mr. Anderson was then allowed to leave. Eugene Carl Markmen  was then called to the stand by Mr. Langdon. He lives in Sterns County and voted by absentee because he was an election judge. He has voted absentee before. As an election judge he stated that his ballot was likely rejected "because the 'n' on the end of my name is not got two humps in it, it has one hump and a line that goes straight down." In the cross examination, Mr. Marken stated that he was asked to intervene in the lawsuit by Publica. Mr. Markmen stepped down. Kevin Hendrickson  was then called as the next witness, but before he could take the stand the Franken campaign objected because "this individual was not on the list." The court allowed the witness, but will take the objection under advisement. Mr. Hendrickson is from Zimmerman and was eligible to vote in the past two elections; he stated that he "voted in the past two." The Coleman campaign basically established that Mr. Hendrickson does not know why his vote was not counted. Mr. Hamiltion, of the Franken campaign, then tried to deduce what the witness "does not know," by asking him who rejected his ballot; Mr. Hendrickson confirmed that he did not know. 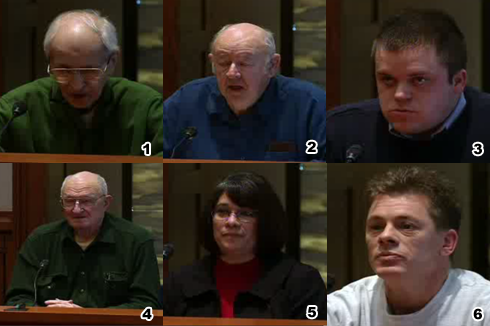 The next witness was Wesley A. Briest . The Coleman attorney began by asking Mr. Briest how he voted. Mr. Briest responded by saying that he "went to the voting place and voted, not by absentee." He was however called to the stand because he voted absentee, the Coleman lawyer corrected his previous assertion by providing a document of his absentee ballot envelope. Mr. Briest then asserted that he had voted absentee. During the cross examination, Franken's representation suggested that Mr. Briest may have voted in person on election day as well as by absentee; Mr. Briest denied this assertion and affirmed his earlier claim that he had voted by absentee only. The Franken Attorney then asked Mr. Briest to observe that the address box for a "non-notary witness" was not filled in on the absentee ballot envelope; Mr. Briest then acknowledged that the form was not completed. The Coleman campaign responded by asking where his wife lived and Mr. Briest replied "with me at the same address." The Franken side then argued that this fact was not stated anywhere on the envelope. Mr. Briest was excused. Mijanou Rodriguez Sampers  was the next witness; she resides in Rosemount and is a registered voter who cast an absentee ballot in the November 4th election. Mr. Langdon essentially confirmed that Ms. Sampers could identify her own signature on her own absentee ballot. Mr. Hamilton then lead the cross examination; he preceeded in a manner very congruent with his cross examination of Mr. Hendrickson. Mr. Hamilton then learned that the Republican Party contacted Ms. Sampers and alerted told her that her ballot was rejected; the Republican party contacted the previous 4 witness as well. Mr. Langdon concluded by establishing that Ms. Sampers did request an absentee ballot. She had not been shown her absentee ballot request form. She was then allowed to step down. And the final civilian witness brought forth by the Coleman campaign; Douglas Thompson . His girlfriend, "of 20 years" filled out his absentee ballot request form. The Coleman campaign then asserted, with Mr. Thompson's assistance, that he had filled out the actual absentee ballot himself. The Republican Party contacted Mr. Thompson as well, informing him that his ballot was not counted. The witness believes that his vote was not counted because his girlfriend signed his name on the request form, and he signed his own name on the actual ballot. Witness dismissed. The common theme amongst all Coleman witnesses seems to center around the voter's claim of wrongful rejection, not necessarily the legal claim regarding the rejection. Both campaign's attorney's were very polite to the witness throughout the day's events. Jim Gelbmann, Dep. Sec. of State. was then called to the witness stand to testify. The Coleman campaign essentially asked Jim Gelbmann to define the process by which wrongfully rejected absentee ballots. were counted. The Coleman campaign was attempting to show that these ballots were not treated equally by each of Minnesota's 87 counties; this discrepancy would violate equal protection. David Lillehaug of the Franken campaign then began the first wave of the cross examination. It was learned that Jim Gelbmann was put forth by the Secretary of State's office in response to a subpoena request by the Coleman campaign. Mr. Gelbmann's testimony lasted for about an hour and a half; during that time a recess was ordered. After the recess, Mr. Gelbmann went through a series of technical details associated with ballot counting law. He gave specific scenarios related to the requested situations. At the end of the day Mr. Gelbmann essentially stated that any errors in the counting of wrongfully rejected absentee ballots would have to be addressed by the election worker who dealt with that specific ballot. He also went on to state that the head election official, for each county, would have adequate knowledge regarding the roughly 1,400 absentee ballots that were presented by the counties, but lower level election workers would have to be consulted for ballots outside of that subset. Mr. Gelbmann asserted that "each [ballot] has a story behind it." Mr. Gelbmann then spent the last thirty minutes addressing specific situations for accepting and rejecting absentee ballots in various counties, and the various processes used by these counties. The witness was then dismissed, for the day. The Franken campaign then objected to the replacement of sum 500 names to the Coleman campaign's list of 5,000 voters whose absentee ballots were rejected. The Coleman campaign said they were unaware of the situation and would look into it. The Franken campaign stated that this discrepancy was not random. A backroom meeting was then commissioned, and the court adjourned until 9 AM CT tomorrow. 2:47 PM CT: Franken Lawyer Marc Elias is questioning a Coleman aid, Kristen Fuzer, familiar with the processes associated with the photocopying or reproduction of ballots. She had worked with the campaign for about 1 year. She is apparently a "Political Director." 2:52 PM CT: The witness is now reading a brief entitled "Reply for Senate Coleman Memorandum Regarding Improperly Rejected Absentee Ballots." It was apparently authored by the Coleman campaign on November 18th. The Coleman campaign objected and it was sustained. 2:59 PM CT: Marc Elias is attempting to get the witness to reveal the internal beliefs of the Coleman campaign regarding rejected absentee ballots. She continues to say that she is "not a lawyer" and that "I was not in the legal meetings." 3:00 PM CT: One of the judges stated that the purpose of the witness is to "lay a foundation for the admissibility of the [ballot] copying issue." The judge then went on to say that each witness may be recalled at a later date. Apparently Elias was completely unaware that this witness was going to be called to the stand. 3:09 PM CT: Elias just asked the witness to read her own affidavit associated with her contribution to challenging ballots on behalf of the Coleman campaign in Sherburne County. 3:18 PM CT: The witness finished getting "acquainted" with past events by reading, what I believe was here own affidavit. She stated that the Coleman campaign wanted 654 additional rejected absentee ballots. Elias is now done with the witness. 3:19 PM CT: The Coleman campaign then asked the witness if it was possible through the many copies that were made, if some errors occurred. The response: "Yes." Next Witness. 3:20 PM CT: Gloria Sonnet (or Sonnen) works at the law firm Dorsey and Witney in Minnesota. 3:24 PM CT: Gloria was apparently responsible for the compilation of a ballot table. The attorney is asking the witness to state basic facts about the exhibit they are referencing. 3:28 PM CT: A judge just ruled that Exhibits C1 and C2 will be received in the court. I'm not exactly sure what is included, but this is good news for Coleman. 3:30 PM CT: These ballots are marked accepted, despite the fact that they were rejected and not counted. 3:33 PM CT: The witness and lawyer are going through a list of ballots contained within Exhibit C1 and verifying their placement within the exhibit. The ballots listed so far are from Anoka County. A five minute recess has been ordered, which means I can eat quick. 3:47 PM CT: Court back in session. This is going to take forever. They are going through each ballots within C1 and C2 and reading the name of the voter and the original status of the ballot. I should also mention that these are absentee ballots that were not counted. 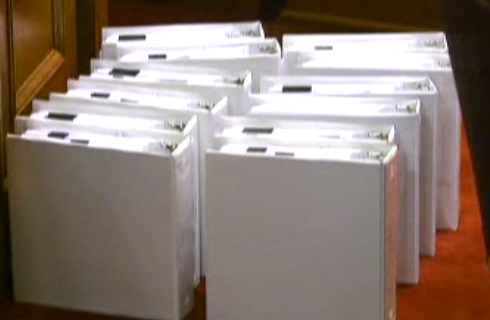 During the recess they showed the binders containing exhibit C1 and C2. There is at least one binder with about an 8 inch spine. I saw three binders total, but they may have been for distribution. 3:51 PM CT: None of these ballots were counted according to the Coleman campaign. The court reaffirmed their motion to conditionally receive these exhibits. Elias stated that "I don't know what to make of these," having just received the evidence and the shift of allocation as Gloria reads through them. 3:53 PM CT: The court believes that election judges and election employees will be called to the stand to speak to the ballots present within the presented exhibits. 3:57 PM CT: There are apparently 5,000 ballots total. This will take a very long time. There are none form Becker County; next onto Benton. 4:05 PM CT: It appears as though they will continue to go through each of the ballots present within C1 and C2; I'll try and get a PDF of the actual exhibits later tonight. They are taking another "brief" recess to consider the objection by the Franken campaign. This will probably be my last entry for today. 5:14 PM CT: The court resumes and declares that the original ballots must be brought to the court house and reviewed in conjunction with Coleman's presentation of exhibits C1 and C2. Coleman must subpoena for this evidence. The court then adjourned. The need for the originals is in large part due to the errors that were made in photocopying the ballots; as previously discussed by the first witness. It seems likely that a subpoena will be granted based upon the Election Contest Court's position. Coleman only needs one county to consent and the rest will likely follow; both based upon precedence and equal protection laws. Last Friday, Norm Coleman put forth a motion requesting that a certain set of identified ballots be sent to the Election Contest Court for inspection; the court then promptly denied this motion. Today's late decision by the court seems to indicate a departure from their previous order; the absentee ballots in question will eventually be transported to the court house for further review, assuming a subpoena from one of Minnesota's 87 counties is approved. Did the Coleman campaign's sloppy copying facilitate the need for original ballots, or did the need for original ballots facilitate the need for sloppy copying? In either case, Coleman's requested relief will eventually be granted. The court reconvenes tomorrow at 9 AM CT. If any new documents are posted, specifically the ballots contained within Exhibit C1 and C2, I'll be sure to let you know. TO: The Honorable Judges of the above-named Court, Al Franken, Contestee. 1. As stated in Contestants' Notice of Contest dated January 6, 2009, Contestant Cullen Sheehan believes and states that Contestants cannot properly prepare their case for trial without an inspection of Ballots and Election Materials relating to the office of United States Senate in the General Election, including, without limitation, all Ballots and Election Materials in the precincts described hereinabove. 2. Contestant Cullen Sheehan therefore requests this Court to order such inspection pursuant to Minnesota Statutes § 209.06 and to implement procedures for appointment of inspectors on behalf of Contestants and Contestee pursuant to Minnesota Statutes § 209.06. 3. Contestant Cullen Sheehan further believes and states that Contestants cannot properly prepare their case for trial without a recount of the Ballots in certain precincts pursuant to Minnesota Statutes § 209.06 and therefore request this Court to order such recount relative to those precincts identified by Contestants. 4. The precincts to be inspected and/or recount are as identified within Exhibit A through Exhibit E attached hereto. In total, the affidavit lists 718 ballots in 86 precincts across 21 counties. Of these 718 ballots, 586 ballots (as listed in Exhibit A and C) correspond to the apparent discrepancy between the number of voters on Nov 4th and the final recounted total. Recalling from our complete precinct data table, there appear to 1391 ballots that meet the specifications set forth by the Coleman campaign in regard to the aforementioned 586 ballots. The increase in the number of anomalous votes presented by the Coleman campaign illustrates a potential realization within their campaign. Based upon yesterday's court hearing and the subsequent motions by Franken, it appears as though the Coleman campaign is building a safeguard against the possibility of the three judge panel ruling against their request to have rejected absentee ballots re-available for review as requested in Article 22 of the election contest and in Article 7 of affidavit filed by Matthew W Haapoja. If we also recall Exhibit C from Coleman's Election Contest and our corresponding article, it is highly probable that the ballots listed within Exhibit A and Exhibit C of this latest filing heavily favor Coleman. If each request associated with these 586 ballots is granted, I believe Coleman would take the lead. Coleman has specified an additional 460 anomalies, above and beyond the 126 first laid out within the election contest. Based upon our simple extrapolation of the 126 original anomalies, Coleman should gain about 51 votes. While I have not repeated the calculations for these additional 460 precincts, I think it is reasonable to assume that these ballots have a high likelihood of benefiting Coleman. The scenario under which Coleman could take the lead represents an unbalanced scenario; if Franken were to submit an equal number of ballots, the effect of Coleman's additions would likely be negated based upon the composition of the 1391 ballots I have previously identified. *If the proposed corrections were to be made, the resulting total number of votes counted would exceed the number of voters recorded on election day. **There is no "Comfort" precinct in Itasca. There is a "Comfort" in Kanabec County; the Kanabec data is used. Within Exhibit B, the Coleman campaign is not only asserting that 39 ballots were erroneously ignored, but that twelve additional ballots, across three precincts, were cast above and beyond the number of voters present on election day. The Coleman campaign has long argued that a discrepancy between the number of voters and the number of counted votes is reason for concern; they appear to be suggesting that other votes were double counted in these three precincts. TO: The Honorable judges of the above-named Court, Norm Coleman, Contestant, Cullen Sheehan, Contestant; and AI Franken, Contestee. PLEASE TAKE NOTICE that [seven citizens] desire to collectively intervene in this action pursuant to Minn. R. Civ. P. 24.01 and 24.02; and that in the event of objection, they will move this Court for an order granting leave to intervene as a party in this action as soon as the parties may be heard. In the absence of objection by an existing party to this action within 30 days after service of this notice on that party, such intervention shall be deemed to have been accomplished. It's tough to determine the allegiance of these seven voters especially given the views put forth by Bruce D. Kennedy, their representation. I find it probable that these seven voters do not represent a single constituency. The third document presented to the election contest court centers on the issue of privacy protection; the document is 75 pages. The filing doesn't appear to contain any election specific requests, but rather attempts to establish standards by which information should be cited and presented while upholding privacy and data practice laws. 2. Granting Petitioners such other relief as the Court deems just and appropriate. This request by Coleman has zero chance of success, or the same chance as Franken's earlier motion for instant victory. Like Franken, Coleman seems to be introducing other beneficial evidence, as described above, into the election contest through the Motion for Summary Judgment. iii. The Court Has Jurisdiction Pursuant to Minnesota Statute § 209.12. The Court finds the Notice of Contest sufficiently Specifies the grounds on which the contest will be made pursuant to Minnesota Statute § 209.021, subd. 1, specifically referencing absentee ballots, missing ballots, and ballots that were counted twice. Viewing the Notice of Contest in light of relevant case law and construing the facts alleged in the light most favorable to Contestants, the non-moving party, Northern States Power, 122 N.W.2d at 3D, the Court finds the Notice of Contest puts Contestee on notice of the grounds of the contest and affords him a fair opportunity to rebut the asserted claims. See Greenly, 395 N.W.2d at 90; Christenson, 119 N.W.2d at 39. Therefore, the Court finds the pleading sufficient to survive a motion to dismiss. The court destroyed Franken's claim, and they are likely to reach the same conclusion after hearing Norm's similar, Motion for Summary Judgment later today. At the hearing on this matter on the morning of January 22,2009, Contestants stated that their primary reasons for requesting an inspection under Minnesota Statute § 209.06 were to narrow the issues for trial and compare voter rolls to the number of votes cast in a precinct Contestants conceded that they would be able to prove their case without an inspection by calling election judges as witnesses, subpoenaing voter rolls, and subpoenaing ballots. The parties already viewed the ballots during the recount process. Given that the trial of this matter must begin on January 26,2009, the Court is not convinced that another inspection of the ballots is efficient or needed to prepare for trial. The Coleman campaign can still however subpoena this information (or attempt to) through the election contest process slated to begin next Monday, the 26th of January. The Election Contest Court has not yet reached a decision regarding today's Summary of Judgment Motion; I will publish an analysis of their decision, when it becomes available. THE COURT LACKS JURISDICTION TO HEAR COLEMAN'S CLAIMS BECAUSE THE NOTICE OF CONTEST FALLS OUTSIDE THE JURISDICTIONAL LIMITS SET BY MINN. STAT. § 209.12. COLEMAN'S OPPOSITION ERASES ANY DOUBT AS TO THE INSUFFICIENCY OF HIS CLAIMS. I'm not really going to go into detail about Franken's motion to dismiss the contest because there appear to be actual anomalies within the recount process. The very purpose of an election contest is to ensure that each and every stage of the counting process occurred lawfully. Any indication of malfeasance warrants an audience of the court. The actual purpose of Franken's motion appears to be information gathering; the last 12 pages of the motion contain documents from the Coleman campaign that were previously not available. COLEMAN'S REQUEST FOR THE PRODUCTION OF 12,000 ABSENTEE BALLOTS MUST BE DENIED BECAUSE HIS VAGUE AND NON-SPECIFIED CLAIMS REGARDING THOSE BALLOTS LIE BEYOND THE JURISDICTION OF THIS COURT. AT MOST, ONLY THE BALLOTS PREVIOUSLY IDENTIFIED BY COLEMAN AND THE ADDITIONAL BALLOTS IDENTIFIED BY FRANKEN ARE RELEVANT TO THIS COURT'S PROCEEDINGS. TRANSPORT AND DEPOSIT OF 12,000 ORIGINAL BALLOTS IS UNNECESSARY AND WASTEFUL WHERE ALL NECESSARY INFORMATION IS GENERALLY ALREADY AVAILABLE TO THE PARTIES. The court case proceedings will take place at 2:30 PM CT in Ramsey County. The events can be watched live at the Minnesota CBS affiliate WCCO. Update [9:40 PM CT]: The three judge panel has taken the issue under advisement; a timetable for a decision was not provided. Barring this decision, the election contest proceedings will officially begin next Monday, January 26th. (f) Ballots which were challenged by representatives of the Coleman for Senate campaign during the Recount, which challenges were erroneously and inconsistently rejected by the Board and therefore erroneously ruled by the Board as votes for Contestee Al Franken. (g) Ballots which were challenged by representatives of the Franken for Senate campaign, which challenges were erroneously and inconsistently upheld by the Board and therefore erroneously not ruled by the Board as votes for Contestant Norm Coleman. Articles 12.D and 12.E govern the improper inclusion or exclusion of wrongfully rejected absentee ballots. These articles do not directly reference any supporting evidence due to voter protection laws. The Coleman campaign may have internal data that supports this case, some of which they presented in Exhibit B, but the public release of this information must be cleared with the voter whose ballot they wish to publish. As such, there is no publicly available information pertaining to the complete subset of wrongfully rejected absentee ballots. Thus, any consideration involving Articles 12.D and 12.E are omitted. The entire election contest contains seven exhibits (A-G); five (C-G) are referenced within Article 12 and are analyzed in detail below. Exhibit A consists of three documents posted on the SOS website pertaining to the recount result. The first document provides a scan of the Certificate of the Minnesota State Canvassing Board acknowledging the result of the recount as signed on January 5th. The second document depicts a scanned copy of the recount results by county as of January 3rd. The final document contains the Senate Recount Canvassing Draft as published on January 4th and presented at the January 5th meeting of the State Canvassing Board. Exhibit B contains the Order of the Minnesota Supreme Court's decision regarding absentee ballots on January 5th. The Exhibit is then divided into Sub-Exhibits, B-1 and B-2. Exhibit B-1 is further divided into four groups, A-D; each of which contains scanned copies of the secrecy labels located on the outside of absentee ballots. Each subgroup contains ballots which were opened and counted during the recount. Exhibit B-2 contains scanned absentee ballot labels which were not opened and counted, but the Coleman campaign alleges that they should have been opened and counted. I have no idea why the Robbinsdale precinct was removed from the election contest brief; although it was the only one, of the 23, to list "N/A" as the challenge reason. 1. The petition of Norm Coleman for relief from the December 19, 2008 decision of the State Canvassing Board rejecting challenges to unmatched original damaged ballots be, and the same is, denied. But our denial of the relief requested does not constitute a binding determination in a subsequent election contest proceeding. 2. Petitioner's motion for a temporary restraining order be, and the same is, denied as moot. MAGNUSON, C.J., and ANDERSON, G. Barry J., took no part in the consideration or decision of this matter. The Minnesota Supreme Court essentially ruled that they could not definitively reach a decision regarding the double counting issue based upon the lack of evidence presented during the oral arguments and within the attached affidavits (case# A08-2206) provided by the Coleman campaign. (1) References non-zero entries within the "Total Voters 11/4 - Pre-Recount Results 11/17" column of the "Anomalous Results" section from any of the precinct level PDFs provided above. Maplewood P-06 and St. Paul W-3 P-09 are not included in this list. (2) References non-zero entries within the "Total Voters 11/4 - Final Recount Results 1/5" column. This list matches the classification used by the Coleman campaign within Exhibit C and is bolded for this reason. Maplewood P-06 and St. Paul W-3 P-09 are included in this list. (3) References non-zero entries within the "Registered Voters 11/4 - Final Recount Results 1/5" column. Maplewood P-06 and St. Paul W-3 P-09 are not included in this list. (4) References non-zero summations of all three columns present within the "Anomalous Results" section from any of the precinct level PDFs provided above. Maplewood P-06 and St. Paul W-3 P-09 are not included in this list. Note: The ad-hoc absentee ballot precinct is not included in any of calculations above. Minneapolis W-3 P-01 is not included in any of the VFA error lists because there were no errors recorded in any of the three columns present within the "Anomalous Results" section from any of the precinct level PDFs provided above. After the final day of challenge resolutions on Friday, December 18th, the Coleman campaign knew they trailed. While the public was unaware of how the withdrawn challenges would lie, my guess is that both campaigns had a fairly good idea of their probable outcome; which eventually resulted in a Franken lead of between 46 and 50 depending upon the day and the source. The very next day, on Saturday the 19th of December, the Coleman campaign filed their case with the Minnesota Supreme Court containing their original list of potentially double counted ballots as discussed previously. The Coleman campaign knew going into the filing that they trailed by about 50 votes and they knew that their list of double counted ballots would probably net them about 50 votes with just the wrongfully rejected absentee ballots left to count. The Franken campaign had long attempted to include these wrongfully rejected absentee ballots because it would likely add to their vote total; the Coleman campaign seemed to embrace this reasoning. Had the Coleman campaign submitted a more comprehensive list of potentially double counted ballots, say a list containing 351 precincts, the Supreme Court may have reached a different conclusion. The Coleman campaign could have lead going into the wrongfully rejected absentee ballots stage; they would have then been in a position to essentially bypass the wrongfully rejected absentee ballots based on the Supreme Court's later ruling. The Coleman campaign could have been in a vastly superior position had they take into account the interest of all Minnesotans, rather than just the Minnesotans in a select 22 precincts. Coleman would likely have been certified the winner and it would be Franken filing the election contest seeking to include the absentee ballots which the Coleman campaign would have likely vetoed. The election night totals indicated 1,396 votes cast (inclusive of accepted absentee ballots). However, the Recount tallied 1,564 votes cast although only 1,533 voters cast ballots according to the precinct's record of pre-registered voters, election day registrants and accepted absentee ballots. Hence, an excess of thirty-one (31) more votes than voters were certified by the Board relative to this precinct in the Recount. The election night totals indicated 1,747 votes cast (inclusive of accepted absentee ballots). However, the Recount tallied 1,764 votes cast. Hence, an excess of seventeen (17) more votes than voters were certified by the Board relative to this precinct in the Recount. It is our understanding that you have not yet located any voter registration applications relative to the 171 additional ballots allegedly "found" in a voting machine in Maplewood Precinct 6, despite your assertions to the Star Tribune (in an article posted online yesterday afternoon) that these applications had already been found. According to the statistical information provided by the election judges to the Maplewood city clerk, a total of 1,396 persons voted on Election Day. That was also the number of votes reported as cast by the summary statement tapes from the ballot counter. Since the total voting reported by the election judges agreed with the total number of ballots cast on the summary statement tape from the ballot counter, there was no reason at the time to believe that there was any problem with either of these data. At the conclusion of the recount for that precinct, it became clear that the summary statement tape did not accurately reflect the number of persons and how they had voted. After reviewing the pre-registered polling place roster, the voter registration cards of election day registrants, and the accepted absentee ballot return envelopes, we have determined that the voter statistics submitted by the election judges were also in error. We have determined from the recount that a total of 1,564 ballots were cast at that precinct. From an examination of the voter registration and absentee voting materials, we can confirm that 1,560 persons voted. It is possible that the other four voters were issued a ballot without signing the polling place roster, but at this point we do not know this for a fact. We will continue to examine the materials in our possession and will inform you if we are able to resolve this matter. While only 1,896 ballots were produced, the figures furnished to the campaigns by Minneapolis elections official Cindy Reichert show that at least 2,028 people voted on Election Day. The machine tape for Precinct 3-1 shows that 2,028 voters cast ballots. Further, according to Ms. Reichert: 1,047 people signed the roster; 932 people were new registrants; and 50 absentee ballots were accepted. The total of these is 2,029. Further, Minneapolis reported that 1,965 people cast votes in the U.S. Senate race. In other words, there are 133 missing ballots. At first glance this Minneapolis precinct appears to mirror the situation of Maplewood P-06; but the correlation between the number of acknowledged voters and the number of recorded votes on November 4th yields fairly conclusive evidence to support the assertion that 133 ballots were in fact lost. There is additional evidence beyond this numerical correlation to support the lost ballot theory. Minneapolis Elections Director Cindy Reichert stated that there were five envelopes containing ballots in Minneapolis W-3 P-01; of these five envelopes, the first is missing while the remaining four envelopes and the ballots contained therein were located. A more official report from Hennepin County suggests that there may have actually been six envelopes; the report also concludes that an envelope label "1 of 5" is likely missing containing the suspicious 131 ballots. The reversion to original election day tally netted Franken an additional 46 votes. The Coleman campaign had an opportunity to re-challenge the challenge ballot determinations of the Minnesota State Canvassing Board on December 23rd. The Coleman campaign presented a list of 16 ballots which they believed merited reconsideration. They also included 24 similar ballots that they believed supported their objective. The Board reviewed these 40 ballots, and nothing happened. If past performance is any indication of future success, it doesn't appear as though the Coleman campaign has a serious case regarding "challenges [which] were erroneously" ruled upon by the State Canvassing Board. The ballots in question can be viewed on the StarTribune website, at least until they're forced to close shop. Norm Coleman is unlikely to pick up enough votes during his election contest to overcome the current deficit. Coleman may have to rely on absentee ballots if he hopes to mount any sort of comeback. Based upon Norm's past performance in the realm of absentee ballots it will most certainly be an uphill climb. Elizabeth Hayden: Stearns County Judge, appointed in 1986 by Democratic Governor Perpich. Denise Reilly: Hennepin County Asst. Chief Judge , appointed in 1997 by Republican Governor Carlson. Kurt Marben: Pennington County Asst. Chief Judge , appointed in 2000 by Independent Governor Ventura. The next step of the process occurs on January 21st when the panel will meet to address Franken's motion to dismiss part of Coleman's election contest. This will not be granted, the election contest will proceed. The actual contest will begin on January 26th but the actual agenda for that date has not yet been set. Is Coleman Fighting Human Error? Yesterday, Norm Coleman made his first public appearance since the State Canvassing Board certified Franken the recount victor. During his speech, Norm stated that "Minnesotans deserve 100 percent confidence that their senator was fairly elected," this is true, but Norm Coleman will not win an election contest arguing that Minnesotans only have 99% confidence in the veracity of the recount. Coleman is hanging his hat on a series of oddities, totaling less than the margin of defeat. The cornerstone of their arguement rests upon the double counting issue and the 171 ballots that turned up relatively late during Ramsey County's recount process. I've compiled a table detailing the breakdown of anomalous results within each of Ramsey County's 178 precincts. Based upon relatively simple math, it appears as though 350 more ballots were counted above and beyond the total number of actual voters; the number of votes does not exceed the number of registered voters in any precinct. This 350 vote discrepancy can mostly be explained based upon the events after November 4th. We know that 171 ballots were found in Maplewood P-6 that were not present on election day; thus they could not be counted as actual votes. Reading through my table, there is a 168 vote difference between recounted votes and total voters in Maplewood's sixth precinct. If these 171 are valid to begin with, there is actually a nine vote drop off between the number of voters and votes cast; a consistent correlation in relation to the rest of Ramsey County's 177 precincts. Subtracting these 171 votes from 350 yields a diminishing discrepancy of 179. This number can further be reduced based upon the 71 wrongfully rejected absentee ballots present within Ramsey County. That leaves 108 anomalous votes, or just .0388% of all votes cast in Ramsey County. That's fewer than one error per precinct, well within the realm of human error. Reporter A: Is this process fair and accurate and true and are the results that you announced today accurate? Mark Ritchie: As accurate as was humanly possible within Minnesota law. Norm's argument is not without merit however; if the .0388% error rate is extrapolated onto the state's 2,887,337 Senate votes, the resulting calculation yields 1,120 potentially erroneous votes. Coleman would need to win these potentially erroneous votes by over 60% of the two way vote to overcome the current margin of 225. Not only are the numbers stacked against Coleman's election contest, but the very core of his argument hinges upon correcting human error. Based upon the actual court documents, Norm is arguing that "numerous and material errors, mistakes and other irregularities" occurred during the initial canvass, the re-canvass and the recount. Note: The entire premise of this article rests upon the inaccuracy of the "Total Voters in Precinct" column based upon the unlikelihood of that column's pre-recount value remaining consistent through the recounted result, despite an addition to the total number of ballots counted. The election judges apparently didn't run some ballots through the ballot counter after their ballot counter had gone down during the day. So, we had apparently more ballots in the box than we had on the tape. This statement by a Ramsey County election official affirms my explanation for the discrepancy between the November 4th voter records and the recounted vote totals within Maplewood's Sixth Precinct. The election night discrepancy of 31 votes still remains unexplained. These 171 ballots may have been sporadically counted when they were initially run through the machine; whether that means votes were counted twice, or simply the presence of a ballot remains unknown; its even possible that something entirely different happened, we simply don't know. In any case its unlikely to make a difference in Coleman's legal contest. Gary Poser: And on page nine [of this document] our final vote totals, starting with Mr. Barkley with 437,505. Coleman with a, 1,212,206. Franken with 1,212,431. Aldrich the 13,923 and Niemackl the 8,907. Followed by the write-ins and registered write-in candidates on the succeeding pages. These vote totals then included all of the votes from the recount, including any absentees that were counted on Saturday. I have presented in these reports for your consideration. Let me ask for any questions. Mark Ritchie: Thank you very much. Any questions for Mr. Poser? Do I have a motion to accept the Recount Canvassing Report as presented by Mr. Poser? Minnesota Supreme Court Chief Justice Eric Magnuson: So moved. Mark Ritchie: Is there a second? Ramsey County District Chief Judge Kathleen Gearin: Second. Mark Ritchie: All in favor say "I." Five Member Minnesota State Canvassing Board in Unison: I. Mark Ritchie: Opposed, same sign. There you have it, Franken wins the recount. The board agreed to the result and eventually went on to sign the recount certificate officially designating the result. This certificate is different than the election certificate that will eventually be cosigned by Gov. Pawlenty and SOS Ritchie; this certificate simply states that the votes have been counted and the canvassing process has concluded. Tony Trimble: The actions today by the Canvassing Board are but the first step in what unfortunately will have to be a longer process. This process isn't at an end; it is now just at the beginning. We will contest the results, of the Canvassing Board; otherwise literally millions of Minnesotans will be disenfranchised. While we appreciate the effort of the Canvassing Board to do the work, the reality is that any certification of the vote totals at this point is only preliminary. Reporter A: Do we need to do a whole other recount? Fritz Knaak: Well in theory the answer to that question is yes, but that would depend on the parties and what the parties can agree to in the process of the recount. Our expectation is, what usually happens and Tony you can, I haven't anytime on that of course, but a our expectation is that we will reach an agreement as to a proposal. Marc Elias: Today is a great day for the people of Minnesota. I stand before you proudly, as the attorney for the next Senator from state, Senator-Elect Al Franken. Marc Elias also announced that Al Franken would not travel to Washington DC to be sworn in today. Finally, Mark Ritchie held a brief press conference; I missed the first ten seconds or so because I caching video I had already recorded, but nothing notable happened during this time. Reporter B: Is this process fair and accurate and true and are the results that you announced today accurate? Mark Ritchie: As accurate as was humanly possible within Minnesota law. And the issues that were corrected by the State Supreme Court. For those voters in Baghdad and Kuwait whose ballots came in one day late and who were not included in the election, it breaks my heart. And we need to look at some of those issues, but this number that we came to today, 99.97% of the decisions at the local level were agreed to by both candidate's representatives and local officials. So that is an incredible agreement at the local level. 95% of the ballots that were challenged, we all agreed to 5-0 in the State Canvassing Board. All of the big decisions of the State Canvassing Board were 5-0 consensus and there were zero challenges to the wrongfully rejected absentee ballots counted on Saturday. So every step of the process has been one at a time, slow and meticulous, incredible consensus; this number is the culmination of that consensus process. Reporter C: Mr. Secretary, do you believe that all lawful votes that were cast in this election were counted? Or are there some that were not and why was that and does that concern you? Mark Ritchie: Well, within the order of the Supreme Court and within the laws of the State of Minnesota I believe all lawful votes were counted. Reporter D: D you give me an idea how much the recount cost. Initially you said it would be about $75,000 do you know yet? Mark Ritchie: We, our professional election staff anticipated there would be a recount, we made an agreement with the local officials, 3 cents a ballot, that was about $90,000. There's probably been another equivalent to that amount for all the copying, all the setup, everything else; this was going to cost somewhere around $200,000, or a little more. The other plan that the Secretary of States office here had developed in the past to do a statewide recount was actually estimated to be 2 million dollars. That was the process of bringing all the ballots to St. Paul and counting them. So this cost about one-tenth of what had been previously estimated, would be the cost of a statewide recount. I'll update my maps either later tonight or tomorrow and post another article detailing the empirical results of the recount. Note: If you are having trouble watching the embedded video I would recommend centering your screen on the video you want to watch and then refreshing your browser. For some reason this seems to work. If the embedded video still does not work I would simply download the file by right clicking and selecting "Save as..." from the resulting menu.